Kevin McRae has lived in Spokane for more than 20 years, but he's just now about to take his first leap into the city's culinary scene. McRae will combine a few of his passions to open Holeshot Pizza and Brew on the far end of the River Park Square food court. If all goes according to plan, Holeshot will be a flawless combination of two key ingredients: motocross and no-nonsense, thin-crust pies. Though McRae has a few ties to River Park Square unrelated to his newest venture into pizza, his main reasoning for setting up camp now has much more to do with transitioning out of his previous occupation. "I've been in the trucking business for 40 years now and I'm done," McRae said. "I want to be home every day." Trucking might be his most recent profession, but it's certainly not his only, nor will it be the one to influence the pizzeria's design and décor. 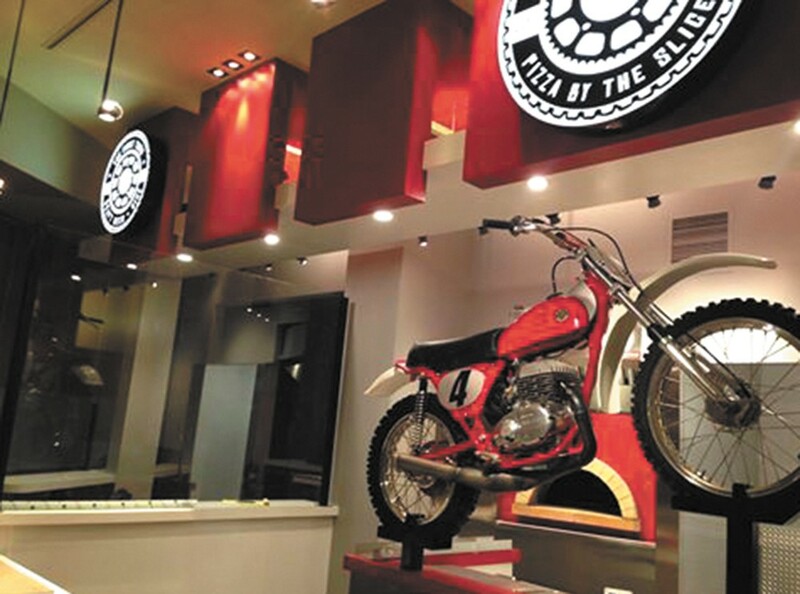 A term used regularly in the sport of motocross, the restaurant's namesake "holeshot" refers to the rider who is first to hit the race's initial turn. That speed is a huge factor for McRae and the type of environment he wants to create. "I just want to promote the sport of motocross, and how much it really goes with the the food court environment because of speed," he said. "When you're getting fast food, you don't want to order a slice of pizza and be waiting around for it for 15 minutes." Customers can expect to get their food hot and quickly, but what exactly will they be getting? Holeshot's menu will take not only speed, but simplicity, incredibly seriously. You can expect to find just four or five varieties of pizza available, with whole pies all coming in at 16 inches in diameter, or you can buy a slice (which McRae says will end up equaling almost a quarter of a pizza) for what shouldn't be much more than $5. There's only one size of fountain drink, just a handful of salad and appetizer options, but everything will come in significant portions, chock-full of satisfying ingredients. This article has been updated since it was initially published.